The wide-eyed, adorably-voiced Tweety Bird is such a favorite among Looney Tunes aficionados that he has a wildly successful line of merchandise emblazoned with his likeness. 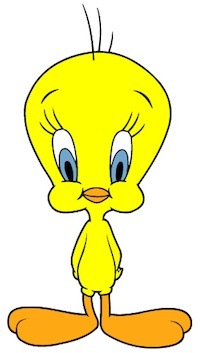 Debuting in the 1942 short A Tale of Two Kitties, Tweety is also one of the older fixtures of the Warner Brothers Looney Tunes/Merrie Melodies universe. Here are ten lessons that little ones can absorb by watching Tweety at work. Looks Can Be Deceiving – Though Tweety’s long lashes and small stature make him seem helpless, he’s actually a crafty little bird who’s fully capable of keeping himself safe. In all of the shorts that feature him as the quarry for a prowling Sylvester, Tweety manages to stay out of the feckless feline’s clutches. Bad Tempers Can Be Overcome – Original depictions of Tweety Bird included an explosive temper as part of his personality; this was later toned down as his character was developed. Kids with a penchant for tantrums might be able to identify with the early version of Tweety, and appreciate seeing him overcome his own anger. Finding Your Niche Can Take a While – Despite a 1942 debut, Tweety didn’t find his iconic role until being paired with Sylvester the Cat five years later. The 1947 short Tweetie Pie pitted the two against one another, creating what would eventually become one of Looney Tunes’ most iconic pairings. Kids can take away the lesson that finding your own perfect place in the world sometimes takes a while, but that patience is usually rewarded. Even the Smartest Need Help From Time to Time – Tweety is usually more than capable of evading Sylvester’s grasping paws, though he does have to rely on a bit of outside help from time to time. Learning that it’s okay to ask for help when they need it, just like Tweety looked to Granny and Hector the Bulldog on occasion. Resourcefulness Can Save the Day – One of the most powerful weapons in Tweety’s repertoire is his ability to use the things and people around him to assist him. Resourcefulness can be a learned behavior; kids watching Tweety can learn for themselves that being observant and resourceful are positive character attributes. Things That Make Us Different Make Us Special – The first thought that comes to mind at the mention of Tweety Bird is his endearing speech impediment. Kids who have their own distinctive characteristics can learn to view them positively by following Tweety’s example. Popularity Can Be Used For a Good Cause – Like many Looney Tunes stars, Tweety Bird is no stranger to the public service announcement, teaching kids by example that using your popularity for a good cause is honorable and important. Strong Things Can Come in Small Packages – Despite his diminutive size, Tweety is a pro when it comes to defeating much-larger foes; in the feature-length hit Space Jam, he can be seen defeating the bullying Monstars with ken po moves. Fans of the pint-sized persuasion can realize that size isn’t the most important factor when facing life’s challenges. Even Nice Guys Have a Mean Streak – Duality and the gray area between “good” and “bad” can be difficult for kids to grasp; watching the protagonist Tweety sometimes behave poorly is a great example of this very real aspect of human nature. Good Things Come to Those Who Wait – As previously mentioned, Tweety existed in various forms before finding his niche as part of the power-duo Tweety Bird and Sylvester. This patience on the part of Tweety’s creators certainly paid off; the debut vehicle for the pairing went on to win Warner Brothers their first Academy Award. In addition to these ten lessons, Tweety also teaches us that when you ‘taut you saw a puddy cat’ – YOU DID!